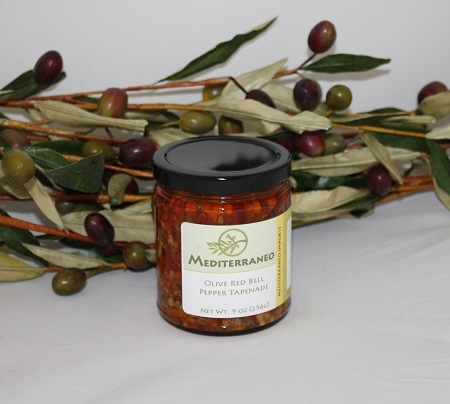 Green & black olive and sweet red bell peppers ssoaking in a special marinade consisting of virgin olive oil, capers, garlic, and other spices. Spread it on ciabatta bread or a baguette with brae cheese, and bake at 350 F for 5-10 minutes and eat! Great as a topping on a chicken salad, pasta, scrambled eggs, or mix 2 parts whipped cream cheese to one part Olive & Red Bell Pepper Tapenade to use as a vegetable dip or on crackers or bread. Also can be used as a stuffing for lamb or chicken, and great as a pizza topping.